I grew up with practical, resourceful parents. 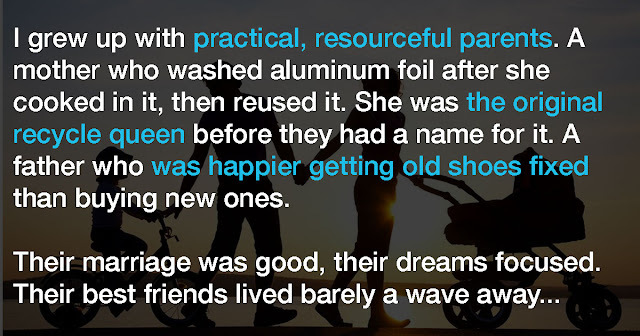 A mother who washed aluminum foil after she cooked in it, then reused it. She was the original recycle queen before they had a name for it. A father who was happier getting old shoes fixed than buying new ones. Their marriage was good, their dreams focused. Their best friends lived barely a wave away. I can see them now, Dad in trousers, t-shirt, and a hat, and Mom in a house dress, lawn mower in one hand, and dish-towel in the other. It was the time for fixing things. A curtain rod, the kitchen radio, screen door, the oven door, the hem in a dress, the repair of the car. Things we keep. It was a way of life, and sometimes it made me crazy. All that re-fixing, eating, renewing. I wanted just once to be wasteful. Waste meant affluence. Throwing things away meant you knew there’d always be more. But then my mother and dad died, and on that clear summer’s day, in the warmth of the hospital room, I was struck with the pain of learning that sometimes there isn’t any more. Sometimes, what or who we care about most, gets all used up and goes away…never to return.. So… While we have it….. it’s best we love it…. And care for it.. And fix it when it’s broken And heal it when it’s sick. This is true. 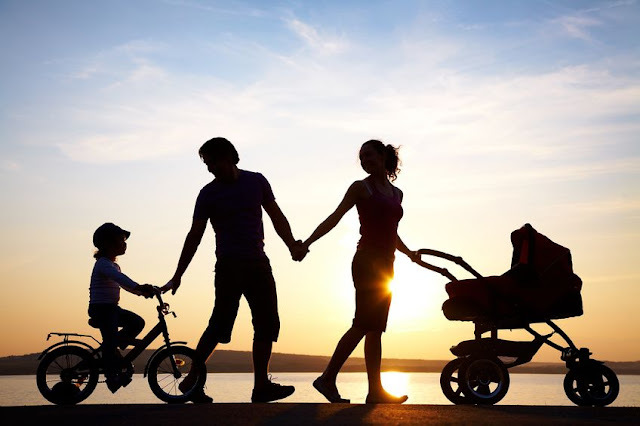 For marriage and old cars….. And children with bad report cards…. And dogs with bad hips…. And aging parents And grandparents. We keep them because they are worth it, because we are worth it. Some things we keep; like a best friend that moved away or a classmate we grew up with. There are just some things that make life really important, like children and people we know who are special, even though sometimes we act as though they don’t exist but they do….they do. And so, we must and should always keep them close! I’ve sent this to the people I think of as keepers… Now it’s your turn to send this to those people that are “keepers” in your life. Family and good friends are like stars…. You don’t always see them, you don’t always agree with them, but you know they are always there….until they’re not!!! So while there is still time, let us all remember to keep these special people close!